The quality of XBRL-based public company digital financial filings to the SEC continued to improve and some important milestones have been reached. As a reminder, this measure compares XBRL-based reports submitted to the SEC with approximately 22 basic, common sense fundamental accounting concept relations using an automated machine-based process. It is expected that 100% of all XBRL-based financial filings to the SEC would be consistent with all 22 basic, common sense accounting relations. Certain specific categories of filers have been removed such as "Funds and trusts" which have unique reporting practices and are not expected to follow these basic relations. The purpose of these tests is to determine the basic abilty of an automated machine-based process to make use of information in XBRL-based public company financial reports. These basic accounting relations consider 100% of the reporting styles of public companies. Filer error, where the filer represents a relation which is inconsistent with US GAAP. For example, one common error is to use the concept "us-gaap:IncomeLossFromContinuingOperations" to represent the line item "Operating Income (Loss)" in a financial report. The proper concept is "us-gaap:OperatingIncomeLoss". US GAAP XBRL Taxonomy error, where a filer cannot possibly represent information consistently because a concept is missing from the taxonomy. For example, the US GAAP XBRL Taxonomy does not have a concept to represent "Operating and nonoperating revenues". Therefore, filers must create an extension concept or use some inappropriate concept and automated processes may misinterpret reported information. Test metadata error, where the mapping rules or impute rules used to obtain information and test the relations between reported facts are inconsistent with US GAAP. For example, if a test disallows a relation that is allowed under US GAAP, this is a metadata error. The column "Percent Without Error" in the table below indicates the percentage of a generaor's (software vendor or filing agent) filings which are completely consistent with expectations represented by the set of approximately 22 relations. 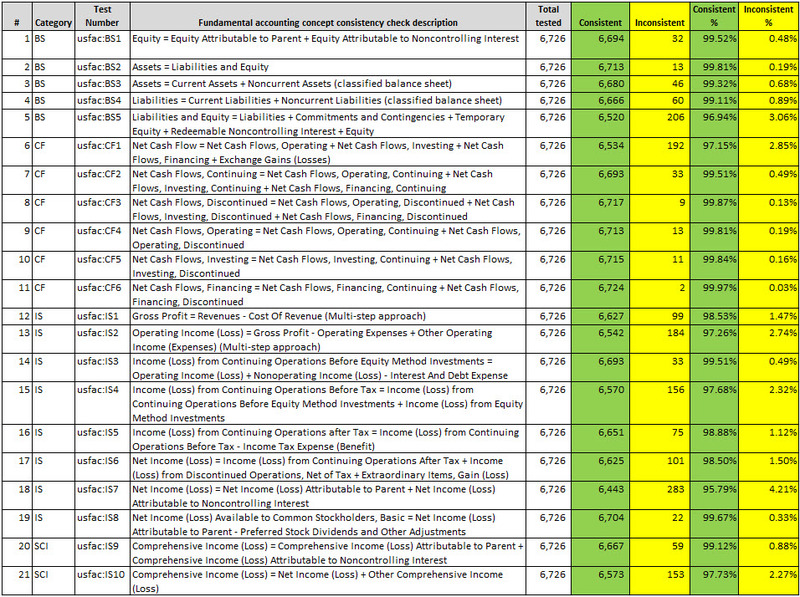 For example, the first generator in the list "Merrill" created 469 XBRL-based financial filings which were submitted to the SEC, 454 of those contained no inconsistencies, and therefore 97% of the filings they created were completely consistent with what is expected by the 22 consistency tests. 5 software vendors/filing agents have achieved 90% "Percent Without Error" or better. 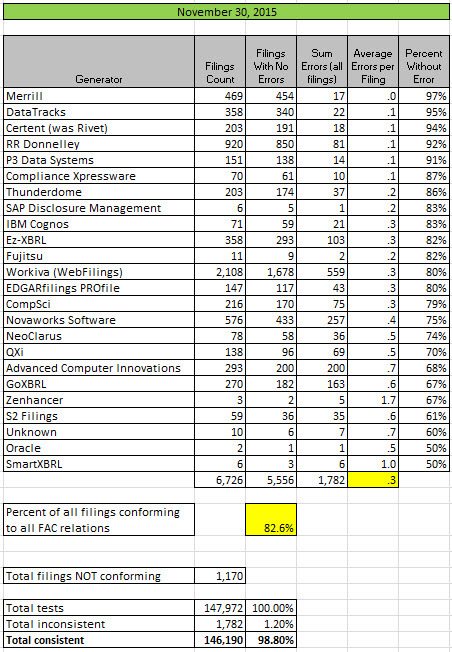 13 software vendors/filing agents have achieved 80% "Percent Without Error" or better. 82.6% of all 6,726 XBRL-based financial filings to the SEC were completely consistent with all 22 basic common sense accounting relations. Total inconsistencies has dropped below 2,000 for the first time and now stands at 1,782 inconsistencies. For more information or to obtain a complete set of test results, please contact me. The documents Arriving at 2014 Digital Financial Reporting All Stars: Summary and Understanding Minimum Processing Steps for Effective Use Of SEC XBRL Financial Filing Information, provides helpful information if you want to better understand the tests and testing process. Again, great work to the software vendors, filing agents, and public companies who are blazing the digital financial reporting trail! Previous results reported: October 31, 2015; September 30, 2015; August 31, 2015; July 31, 2015; June 30, 2015; May 29, 2015; April 1, 2015; November 29, 2014.